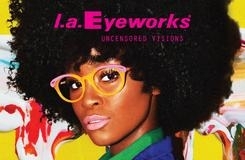 Alexander Gray Associates presents The 4th Annual l.a.Eyeworks Eyewear Shopping Event to benefit Art Matters. Join us for an extraordinary eyewear shopping event featuring l.a.Eyeworks groundbreaking designs for prescription eyewear and sunglasses. l.a.Eyeworks began in 1979 when Barbara McReynolds and Gai Gherardi opened a single storefront on Melrose Avenue in Los Angeles, California. The original whim for this adventure was to challenge the prevailing norms of eyewear with proposals for a new, provocative revelation of the face. More than three decades and hundreds of frame designs later, l.a.Eyeworks remains a privately owned house of optical imagination, encompassing two namesake retail stores in Los Angeles and a wholesale company that channels its designs to a global network of independent opticians and retailers. Art Matters, a 30-year-old non-profit foundation, supports individual artists working in contemporary art and performance whose work intends to break ground aesthetically and socially. The foundation began as the brainchild of philanthropist Laura Donnelley and educator Philip Yenawine who wanted to assist artists struggling to say something with bite and punch, artists who made “art that mattered.” Art Matters has given over 2000 grants to US artists for fellowships and collaborative projects all over the world.